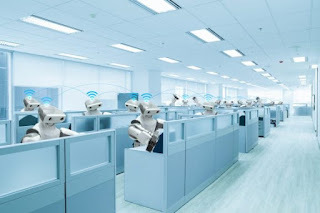 70% of the American public fear that AI will have a negative impact on employment in the U.S. Americans in the workplace believe that 30% of their work could be replaced by AI-enabled automation technology within five years. And when asked what they fear most from AI overall, job automation was the number one fear. Yo effectively sell AI to organizations or to the public, vendors should lay off the technobabble and tech-washing and promote the honest benefits of AI as automation technology. Artificial intelligence may well pose an existential threat to humanity. But that’s not what worries the public. What worries most people is jobs. According to a new study conducted by my team at SYZYGY, 70 percent of the American public fear that AI will have a negative impact on employment in the U.S. On average, Americans in the workplace believe that 30 percent of their work could be replaced by AI-enabled automation technology within five years. And when asked what they fear most from AI overall, job automation was the number one fear. Fears of job automation are not new and have been ludicrously overblown in the past. Can you think of a job that was entirely automated — apart from elevator operator? But today’s fears are now turbocharged with the AI media hype. The narrative is simple. Advances in AI mean the shrinking manufacturing sector is not the only area at risk for a robot takeover. The rise of AI software algorithms means that white-collar work is under threat, as well. Take, for example, the 2.2 million Americans who work in call centers today. The Economist predicts that AI technology will soon automate these jobs, because any job that follows a script or process is at risk for algorithmic automation. The influential “Frey and Osborne study” on the future of work for 702 U.S. occupations concludes that 47 percent of total U.S. employment is at risk of becoming automated over the next two decades. Already, 6 percent of American workers have lost a job or hours due to automation, according to the influential Pew Research Center. Forrester predicts that AI will eliminate 6 percent of all U.S. jobs within the next three years, and while AI will create new jobs, the net loss by 2025 will be 7 percent. Only time will tell whether these predictions are accurate. But what is true now is that people associate the complex subject of AI with the easy-to-grasp idea that this technology means job automation, whether that’s automating the jobs we do at home or the job we do at work. If AI means automation in the minds of many Americans, AI vendors can either sell AI as automation technology or seek to reframe AI as something else. IBM, for example, has chosen to tech-wash AI and re-brand it as “Augmented Intelligence,” augmenting rather than replacing humans in tasks that require intelligence. Robotics vendors have done likewise, rebranding robots as “cobots” (collaborative robots) that work alongside, rather than replacing, humans. This PR push for AI is all very nice, but from a marketing perspective, selling AI to American workers as anything other than automation technology is a tough task. It’s far easier for marketers to work with existing perceptions, building on the idea that AI means automation and highlighting the advantages of such automation. These advantages could include cost savings and reduced risks for employers. For employees, automation could mean freedom from repetitive, mundane, or dangerous tasks. Interestingly, AI-powered automation may even buy happiness. Recent research shows that when people pay for time-saving services, they report being happier. It turns out that money can buy happiness, but only when we use it to buy ourselves time. This may be the biggest benefit AI has to offer. In summary, what recent research indicates is that in order to effectively sell AI to organizations or to the public, vendors should lay off the technobabble and tech-washing and promote the honest benefits of AI as automation technology. Some say we are each born with 3 billion heartbeats, and AI automation technology will allow us to spend them on the things that really matter to us.